Bin blenders or conta blender , Container tumblers are used mainly for blending of dry powders for tablet production and capsule, which facilitates better flow for tablets and capsules. This is a closed contained, totally dust free single step transfer system. It can handle more than one size of container tumblers. In granulation room the dry granules enter to the IBC container for blending through a dust free connection and the same IBC container is loaded over to the blender for blending. The IBC bin locked in the resting frame in 15° then lifted by hydraulic system in 15° inclined position after that the IBC bin rotates for blending with 3 dimension action. This same container after blending loaded over the tablet press for unloading in to the tablet press hoppers. IBC Bin Blender for Ideal dry mixer for lubrication of granules and homogenization mixing and conveying of the material to further process. Available Capacity: 25 kg to 500 kg batch size. 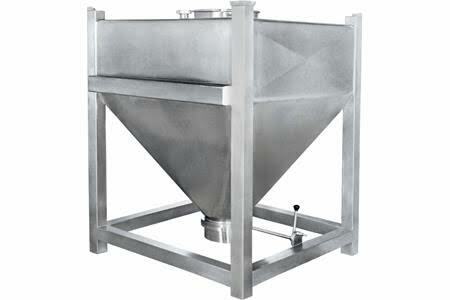 Interchangeable different capacity IBC Bin can be used on same machine use for mixing. This is a closed and contained system where by a single step transfer material from Container of the Conta blender is transferred to the tablet press hopper. Also another advantage is adaptability of this system to handle more than one size of bunkers or containers so processing of different sizes of production batches in single equipment. Enclosed rigid drive with reduction gear box and motor in the machine structure. Hydraulic power pack system for lifting of product bin for mixing. IBC Bin having discharge with butterfly valve and trolley for easy mobility. Overload relay protection & Emergency stop button..